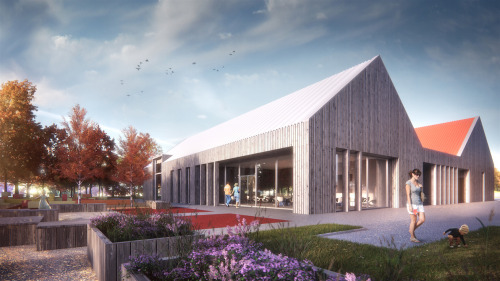 Collective Architecture are delighted to announce that plans have been submitted to Fife Council for a new community hub facility in Tayport. The proposed facility is designed to have light flexible spaces to cater for a range of uses including Sports, Arts, Business and Tourism. The building should offer something for everyone. It will create jobs, enhance health, attract visitors, foster sustainability, and bring renewed interest to this often forgotten corner of the North of Fife. The site has a unique setting located at the southern edge of Tayport next to three Sites of Special Scientific Interest. In responding to the rich history of the site and the wider landscape setting, the proposal touches the landscape lightly, nestling in it’s surroundings, whilst gently reflecting the industrial past of the site. been select to contrast with the Scottish Larch and make reference to the former steel work industry previously located on the site. Whilst contrasting with the earthiness of the adjacent block, the metal cladding will glisten when wet, reflecting dappled woodland light. 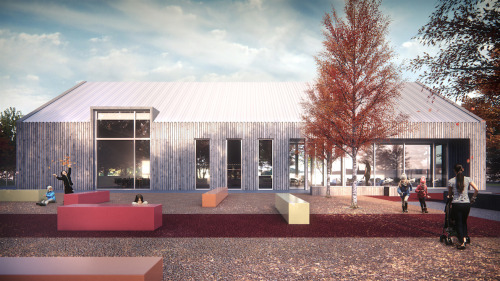 “Tayport Community Trust is really pleased to be working with Collective Architecture and their partners to develop a Community Hub in the town. This development has had a boost recently with the approval from Fife Council to begin the process of transferring ownership of the former Abertay Works site in Tayport to the Trust at a discounted price. This transfer, and the design and planning work by Collective, will enable a piece of land that has fallen into increasing state of dereliction over the last 20 years to be regenerated and developed over the next few years into a vibrant and sustainable resource for the local community and visitors to the area. Trustees are continuing to work closely with Collective to ensure that the first phase is affordable and sustainable whilst delivering what is needed for the local community. This positive step is a huge milestone in a project that has been at the heart of local people for many years and represents the faithful diligence of trustees in continuing to move this forward. Now, with a planning application submitted, and some key funding milestones approaching, this project is the closest it has been to becoming a reality.